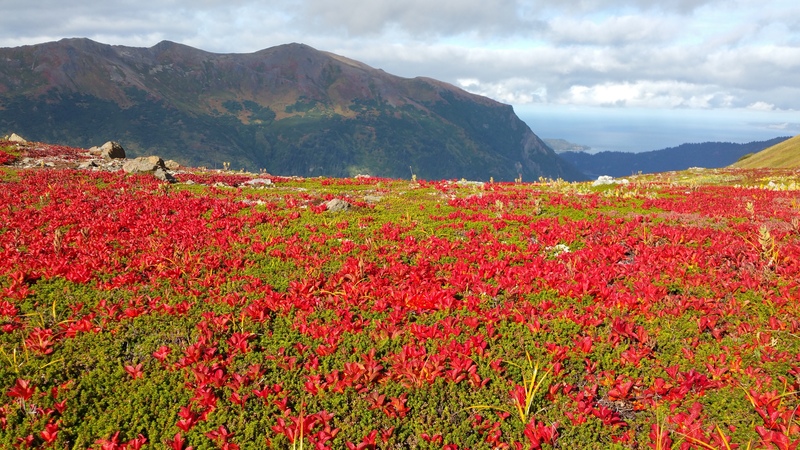 Bright red flowers illuminate the mountain top. It’s fall in the alpine, for sure! The morning of The Hunt dawned cool and clear. As I packed my gear into my truck, I looked up at the pre-dawn sky, and saw stars for the first time in over two weeks. Driving down the hill the seven miles to the harbor on the Homer Spit, I was stoked to finally have a stellar day to pursue a giant black bear. Landing the boat typically goes off without a hitch – especially when you are, apparently, the only dude alive and moving in the harbor! This is one of the reasons why we love the off-season up here. It’s such a different feel and pace than the busy tourist season, when you often have to wait in line to launch your boat. Driving across the bay – seas were calm and I was able to go full-tilt all the way to my destination. Spirits were high as I placed my gear on shore, moored my boat in 25 feet of water, and paddled our little Old Town canoe to shore. 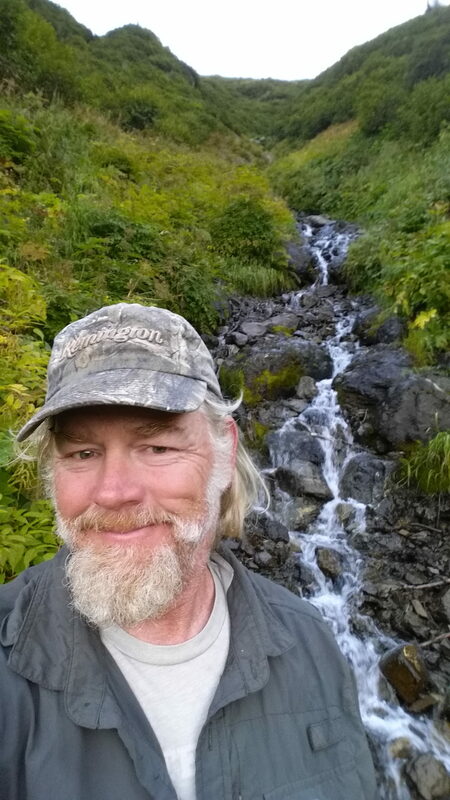 After stowing the canoe at the high-tide mark, and tying it to an alder tree, I then proceeded to begin hiking up a rocky drainage that would take me up to the high country. This would be my first time up this mountain – where there really are no established trails, other than those made by wildlife. Before leaving the shore, I had paused to glass the high hills, and had spotted at least three of my quarry high up in 5 bear bowl. One was a sow bear with her cub (off-limits), and the other appeared to be one of the big boars I had been observing for the past couple of weeks. I knew there would be more bears, but seeing a few prior to leaving the beach added incentive to my hike. I started out at a modest pace, excited to get up there as soon as I could, but also knowing that one slip on the boulder sized rocks could end in a sprained ankle, twisted knee, or broken leg – which would end my day prematurely. Several hundred yards up the avalanche chute, I noticed water starting to trickle from the rocks; the water came in increasing volume the higher I went. I paused often to drink from the ice-cold mountain water – which was likely a result of the rain water that had fallen steadily for the past two weeks. Planning to be carrying a bear down, I had made my pack light- bringing only enough clothing, food, and tools as would be necessary to accomplish this hunt, and get back down to my boat before dark. I paused to look down, enjoy the view from my height advantage, and snap a photo. I noticed a small skiff go by, far below, with two people, right in the neighborhood of where I had moored my boat. Hmmm, wonder what they’re up to, I thought to myself, but didn’t go much farther than that. Farther up the waterfall, I was super glad to have worn my big insulated Muck Boots. They are almost knee-high, very heavy, and not what you would typically find someone wearing on a hiking adventure in the mountains – but these boots offer me much needed ankle support, are very warm, and were keeping me bone dry as I waded back and forth in pools, looking for the best way up. There were at least three actual waterfalls – where the water spilled off a cliff that was 5-8 feet high, and for each one, I had to find a way up and around – sometimes climbing up rocks on the side, sometimes pulling myself up with thick grass and small alder trees. Interestingly, at the top of the last and highest waterfall – the water disappeared completely, and I realized that all of the water being collected from higher on the mountain was coming out here from under the earth. Now the sound of rushing water that I had become accustomed to was gone, and as I walked further up, it became more and more still. I could hear birds singing, eagles soaring, a boat going by far below, and whats that? Peoples voices? To my dismay, I realized that whoever had driven the boat by earlier had the same idea as me – to climb this mountain on this perfect day, in this very same way. What’s the odds of THAT? Normally, I wouldn’t care. I like it that people are out hiking, enjoying the state park, and I especially admire it when folks are hard-core enough to be doing something really challenging. The problem with this couple was two-fold. One, they were traveling much faster than me, and two, they were talking very loudly. Looking down at least two hundred yards, I could see a man and a woman, and I could hear every word that they were saying. When my friends and I hike in the woods, we whisper, because we WANT to see bears. These people sounded like they didn’t want to see any wildlife at all. I began to imagine that my hunt would be ruined. When I had previously been having the time of my life, I suddenly felt unsettled, and sort of violated. They caught up with me before long. We exchanged pleasantries. Knowing myself, I probably appeared straight-faced and intense. I was curious what they were up to. The man spoke up: “Oh, it was such a beautiful day, we hired a baby-sitter and decided to try and see if we could make it to the summit.” “Wow”, I said, “You two are ambitious today.” I smiled and told them that I was bear hunting. That I had been watching these bears for weeks. Noticing that they had no protection whatsoever, I added “there are lots and lots of bears up here, and if you make it up near the peak, you will see for yourself.” I won’t lie, they seemed like the young, nature loving hippie-type – who wouldn’t hurt a flea and might not want to see one either, but all the bear talk didn’t deter them. Since we were getting up into some very steep shale slides, and there were numerous options to get to the top – I suggested that we choose different routes, so that we could both do what we came for without getting in each others way. They agreed to go up near the ridge line, and I would stay down just above the alders. I stepped aside, and regretfully, I let them pass me. After we parted and they continued up the mountain, I was very worried. In my head, all I could think of was that they would get up above much quicker than me, and spook all of the bears down into the alders for the rest of the day. That would put an end to my hunt for sure, and if I really thought it was the a for sure thing, I would have turned around and gone back down right then. Disappointing as that sounded, I also knew that I wanted to scout out this country, and I had really been wanting to lay my eyes on 5 bear bowl – if nothing else, just to see all that is hidden from down below by a defining ridge that raises up at the base of the bowl. And, I felt like I still had a chance of scoring, albeit small. I quickened my pace, scrambling up a steep shale slope that was all hands and knees crawling. It was slow going because every time I gained two feet, I would lose a foot as the ground crumbled away below me, sliding down the hill, and taking me with it. Up above me and to my right, the alders had been growing thick along the lip of the drainage, but I noticed an area where they were thinner, and I made for that. I found a good sized stick, and used it as a cane, to steady myself, and push myself up when needed. Finally, gasping for air, and wet with sweat, I reached up for an alder bush, and hauled myself up on the lip. This is what I love about Alaska, for with one such move, you can change environments completely. Now, I was almost above treeline, but not quite. What lay before me was a beautiful, steep meadow covered in wild grasses, wild flowers, cow parsnip, devils club, and occasional patches and strips of alder bushes. Below me, it was 100% alder trees, all the way to the bottom – alders so thick that getting into the middle of them is akin to being put in jail with hundreds of thousands of bars. I’ve attempted to travel through them before. Going up is near impossible. Going down can be too – especially when up in alpine areas like this, where alders are thick and young. I sat to drink a bottle of Blue Gatorade and eat a Snickers Bar. Several hundred yards directly above me, I could hear the happy couple giggling and laughing and talking about a friends new, spacious apartment. I knew I had better get going if I expected to have any chance at a bear. With a heave I was up, and side hilling as fast as I could, with my make-shift cane to support my down-hill side. A couple of times, I had to crawl my way through strips of alders – which want to grow parallel to the earth, and then up. But as they grow up the steep hill, they are layered one right above the next, and at times, can be almost impenetrable. This is where, if you are in a hurry, you tend to get scratched up, bruised, and irritated – all of which I did. For right above me, I heard several birds flush loudly – what I guessed to be Rock Ptarmigan that my giddy-loud couple had just flushed. They yelled and screamed as if startled by Satan himself, and inside, I was dying. The sow bear and her cub would be in ear-shot by now, and the big boar, not far from that. In fact, who knows how they had been moving over the several hours while I had been hiking? They could have worked our way, and if so, they would already be spooked by the last outburst for sure. Again, harvesting the bear felt forbidden. “Hello up there. Can you hear me? I tried to yell as softly as possible, while still being certain they could hear. It must have worked. The sow began woofing, sort of like a dog does, but with a bear, it”s a much louder, sharper sound – for I could hear it from four hundred yards away. She stood up on her hind legs, to get a better view of the couple – so that she could decide how to react. I’m guessing some rocks were in the way, because she went back down on all fours, and ran up the hill toward the couple, to get around a rock pile, and get a better view. This was good and bad. Good because I figured she would slow down the couple even more, while I made more distance between us. Bad, because her alarm calls would put any other bears within ear-shot on high alert. I worried not for the couples safety (though I would have climbed to save them if necessary); I just kept on truckin’. Ahead of me was the end of the high ridge that sits in front of 5 bear bowl. On my side of the ridge was some little rolly-polly hills, and some big broken rocks and boulders. If I could just get to there, my view would open up significantly. I hurried on, and suddenly, with a knee-jerk reaction, I went down on the ground. “Holy Crap, Big Bear,” I muttered to myself, as I slid behind the nearest rock. Off came my pack, and I reached into a front pocket for my binoculars. I also withdrew my range finder, and took my gun out of it’s harness. I began observing the bear while my mind was racing. My original plan was to quietly hike into the bowl, sneak around, observe ALL the bears, choose the one I wanted, and make my stalk. However, with my giddy hikers now exclaiming to one another while the sow tried to decide to go up or down – the need to decide on this particular bear in front of me, was feeling more and more urgent. I took up my rangefinder, and it told me the bear was 218 yards away. My rifle is sighted in for that, but I decided to see if I could cut that distance in half. Dropping below a small rise, I went from boulder to boulder, always keeping my eyes on the bear. He was feeding intently, nose on the ground, devouring mouthfuls of delicious mountain blueberries. His hind end was facing me as he cast his busy lips first to the left, then middle, then right, then a short step uphill to get him into fresh dining. I looked ahead, and saw the end of my small rise, and just behind that, a good-sized boulder. After that, there would be nothing but short grass and blueberries between me and the bear. I made the last rock, noticed that the mother bear and her cub were now running fast, down the hill, away from the couple, and toward me. In my heart, I knew that the big boar would be running away too – within the minute. I raised my rangefinder again: 130 yards. I raised my binoculars. The boar was beautiful: jet black, big head, short blocky nose, slight hump at the shoulder, belly hanging almost to the ground, and a big old booty. I changed from my binoculars to my rifle scope, and the bear turned broadside, as if to offer himself to me. Of all the bears I have taken in my life, I knew this one would far surpass (in size) anything that I had ever harvested before, and I had better be darn happy to get up here in this high country, under these circumstances, and come away with any bear. Decision made, I powered the scope up, put my backpack on the rock for padding, rested my gun on the backpack, settled the crosshairs high on the bears right shoulder – right where it meets the spine, and squeezed the trigger. I wish I had a video camera on the bear, as it collapsed, and began rolling down the mountain – all four legs flopping wildly, completely out of control. The sight struck me as comical. It’s just not something you see every day, not something I was expecting. A few seconds later, the bear came to rest on a small spot that had thick grass, and was slightly more level. He raised his head one last time, and I drilled him again, just for insurance. The whole thing took less than ten seconds, and he never moved again. Body trembling, I relaxed into the rock and lowered my rifle. I realized that my entire body was shaking – probably half from the strenuousness of the hike, and half from the exhilaration of what had just happened. I took in the beauty of my surroundings: the high blue skies amidst a primary vegetation color of yellow-green, but also mixed in were bright red flowers, and blue ones too. High above me, in the jagged peak to the right, stood several mountain goats -obviously feeling safe and completely oblivious to what had just happened below. Gathering my things, I walked over and began to admire my bear: his huge paws and long, curved claws. My bear had a great big noggin, and a great big rump to go with it. His nose was short and blunt, and his ears appeared small compared to his head size – signs of a big old boar. His upper canine teeth were long and yellow, and striated for their entire length, while his molars and incisors were ground down flat – also signs of a mature animal. I photographed the bear from all angles, and then, I grabbed another gatorade, a snack, my binoculars, and went for a stroll. It was fun to find out that I had a little bit of cell phone service on the knoll that stuck out the farthest toward Kachemak Bay. From there, I sent a few text messages, attached a few photos, and was even able to call a best buddy and relay the story of my hunt. It’s always fun to share the excitement, right after it happens. While I was doing this, I noticed that my giddy couple had circled around above and ahead of me, and at least two more bears were now streaming down the hill, past me, and toward the safety of the alder trees below. One of the bears was also huge, just like mine. Basking in the glow of the beautiful day, and the successful hunt – I hiked about the bowl, pausing to glass unseen areas from new vantage points while I ate lunch and rehydrated – for climbing up the hill had burned up my energy, and had taken a lot out of me. Now I was thinking about what lay before me: butchering a (ballpark) 450 pound bruin solo, and carrying him down the hill. Circling the ridge, I paused to photograph more of the areas beauty, then made my way back to my bear. From my backpack, I withdrew two skinning knives, a sharpening steel, and some large plastic bags. Once I had my knives sharp, I rolled the great bear onto his back. Then, I went to making my cuts – from the heels of the back feet to the base of the tail, from the base of the tail to the sternum, and from the front paws to my center cut. I then rolled the bear onto it’s side, and removed the skin from the carcass – being careful to work around the legs and feet without cutting through the hide. I found that the bear hide was thick and gristly, and was quickly dulling my knives, so I paused often to sharpen them. Once I had half of the bear done, I attempted to roll the bear over onto his other side – but the bear kept rolling down the steep hill as I was unable to stop its momentum. Luckily, it came to a stop on its side again – with the unfinished side facing up, so I continued on, duplicating what I had done on the first side. I was amazed at the amount of fat on this bear – which I am sure measured at least 5 inches thick along the top of the back and hind legs. Once the second side was finished, I skinned the bear up his neck and around his skull – being extra careful around the ears, eyes, nose, and lips. This skin will make a beautiful bear rug for us to enjoy in our home for the rest of our lives, and besides, Maria’s bed and breakfast/lodge in Homer Alaska NEEDS a bear rug, doesn’t it? Well, I have thought so for years. It will look great in the main living room, in the moose manor apartment, or on the floor in the bears den room. With the bear fully skinned, I proceeded to quarter the bear, and bone out all four quarters, along with removing the backstops. When I was done, there was a huge pile of carcass, guts, bone, and fat that likely made up nearly 2/3 of the bears live weight. This, I left for the scavengers, some of which had been soaring overhead for the past hour. I bagged the rest in large plastic bags, and inserted them into a very, very full pack – one that I needed to lay on the mountainside, and back into and fasten to my back, chest and waist – then use my improvised crutch to help myself stand up. This wasn’t a pack that I was going to be lifting on and off with my own bodies strength, I had to use my head – to find ways to use the terrain and various props to help myself get this big beast down the mountain and into my boat. Ok readers – thanks for staying with me this far. I hope you enjoyed the story of my hunt. Since this is such a long blog post, and there is SO MUCH left to the story, I will close for today – with plans to continue at my next writing opportunity with The Forbidden Bear. Part 3: A Photo Essay Of The Hunt. I took many pictures on the way up- of the beautiful views both up and down, the plant life, the mountains, waterfalls, and of course, the bear. I am so excited to share them with you – but that will be a post in itself. After that, I will write The Forbidden Bear. Part 4: The Descent. Now there’s a story you’re going to want to hear! There’s some major surprises that I didn’t expect, and you won’t either. I am off for another big hike tomorrow morning, and it’s time to turn in and get some rest. I have a friend visiting from California, and earlier today, we spotted 20 bears on two mountains. Several are HUGE. We have been patterning them for two days, and feel we will have an opportunity at a big bear sometime mid-day tomorrow, after we hike up. And I am looking on the bright side – at least I have help this time. I most likely will be writing next when I am in bed recouping from tomorrows hunt. Until then, enjoy this teaser photo of mountain beauty. It’s fall up there! Climbing up the waterfall part of the avalanche chute. I have a long ways to go. It sure is a beautiful day on the mountain.